Doncaster will host three games at the 2021 Rugby League World Cup, it has been announced. The Keepmoat Stadium is among 21 venues – predominantly in the north of England – chosen to host the tournament. Today’s live announcement praised the Doncaster campaign put together by Doncaster Council, Business Doncaster and Club Doncaster. The competition – last held in Australia, New Zealand and Papua New Guinea in 2017 – will be held in England in October and November 2021. 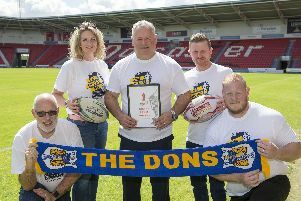 Dons chief executive Carl Hall, who forefronted Doncaster’s #backthebid campaign, said: “I always say ‘you get what you deserve’ and we’ve got our rewards for all our hard work.